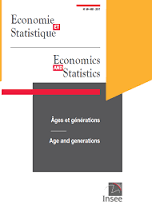 In this article, the effects of age (or lifecycle) and generation on the standard of living are estimated using a pseudo-panel developed from the various editions of the French Household Expenditure Survey (Budget de famille - BdF) between 1979 and 2011. The standard of living of households is calculated using the disposable income or the private consumption per consumption unit, including and excluding expenditure on housing and imputed rent. Using the identification strategy developed by Deaton and Paxson (1994) for Age-Period-Cohort (APC) models produces two main results. Firstly, the standard of living increases significantly with age from 25 to 64 years old. For example, consumption is 35% greater for 50-54 year olds than for 25-29 year olds. From 65 years old, changes depend on the living standard indicator considered. Furthermore, the standard of living of the baby boom generations is higher than generations born before the Second World War, but lower than or equal to the generations that follow. For example, the consumption of the cohort born in 1946 is 40% higher than the cohort born in 1926, but 20% lower than the cohort born in 1976. Considering all cohorts born between 1901 and 1979, no generation has been less fortunate than its ancestors. Discussion of these results demonstrates their robustness, particularly with regard to the results of other identification strategies, including the Age-Period-Cohort-Detrended (APCD) method which removes the linear trend from variables, and an original strategy, the Life Expectancy-Period-Cohort method (LEPC) which replaces the age variable with the life expectancy at each age. It shows the significance of economic growth in increasing the standard of living of generations and confirms that no generation has consumed less than the generations preceding it. Badji I. (2017) Intergenerational Inequalities in Standards of Living in France . Economie et Statistique / Economics and Statistics, 491-492, 71-92.